Recently, Gain (yes, as in the laundry detergent) teamed up with Bronx-born musician Leslie Grace and Portraits of Hope to takeover and liven up laundromats in the Bronx and Washington Heights. Using bright colors and helping hands from the community, the company aims to help add a boost of happiness to the usually dreadful chore of schlepping to the laundromat to wash your clothes. I visited Clean Circle on Webster and 168th this weekend and actually WISHED that I’d brought a load with me. 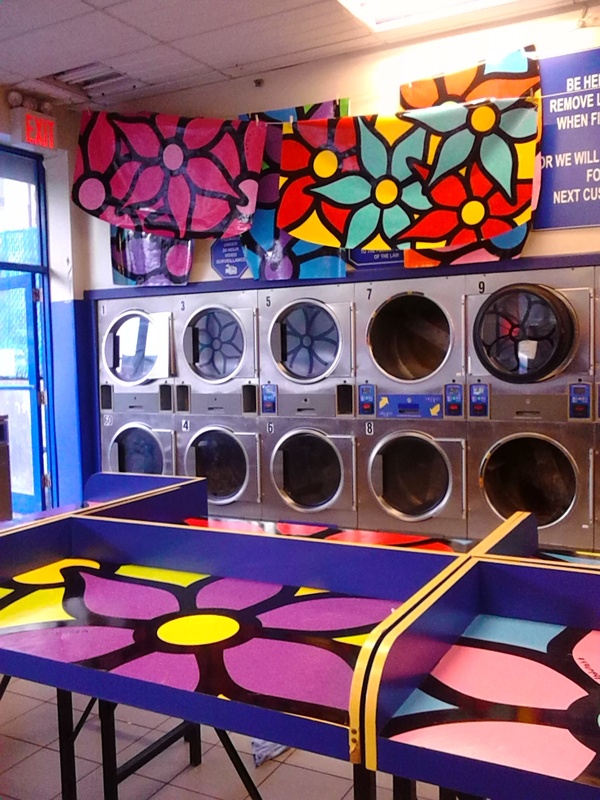 The artwork is plastered on washers, dryers, the walls, just about any place you look. It’s amazing what a burst of color can do to cheer you up, which is part of what Portraits of Hope does with its public art installations – inspire communities and involve them in the process of beautifying their spaces. o Floral notepad for creative inspiration! To enter, simply comment BELOW telling me what is “music to your nose.” Personally, I love the smells of fresh laundry and vanilla by Thursday, June 5, 2014! Check out the closest transformed laundromat near you to enter Gain’s Instagram Selfie Contest by finding the Selfie Station (if you follow me on Instagram, you’ll see my lovely mug at Clean Circle’s Selfie Station) and snapping a photo using the hashtag #musictoyournose. Bronx locations can be found at: 3825 3rd Ave. 10457, 1210 Webster Ave. 10456, 275 E. 163rd St. 10451, and 938 E. 163rd St. 10459. This is part of a sponsored activation with Gain. However, all opinions expressed are my own. The Winner of the #musictoyournose Giveaway is…. I love the smell of Blueberry muffins and cinnamon. The smell of laundry is always music to my nose, too! Thank You. Thanks, Amy! You have been entered into the giveaway. The winner will be announced Friday, June 6! Lavender is music to my nose. Thanks, Harmony! You have been entered into the giveaway. The winner will be announced Friday, June 6! I love the smell of apples! It is definitely music to my nose 🙂 Thank you for the chance! Thanks, Amanda! You have been entered into the giveaway! I love the smell of cut grass and rain. Thanks, Thomas! You have been entered into the giveaway!